In the Simulation Game participated 54 people, out of which: 4 came from Cyprus, 4 came from Belgium, 5 came from Albania and 41 came from Greece. It took place in Athens, Greece from Monday, December 4th until Wednesday, December 6th, 2017. Description: The last phase of RESTART Project concerned the implementation of the Simulation of the European Parliament with the participation of 54 young participants. The Simulation Game is an interactive procedure that simulates with precession the functioning and the decision making process of the European Parliament. The participants took the role of a Member of the European Parliament (MEP), representing a European political party and a member state of the EU, while, following the rules of procedure, they debated on the agenda topic in order to end up to a common report with recommendations regarding the discussed topic. The final report was voted by the majority (50%+1) of the participants and was approved by the institution. 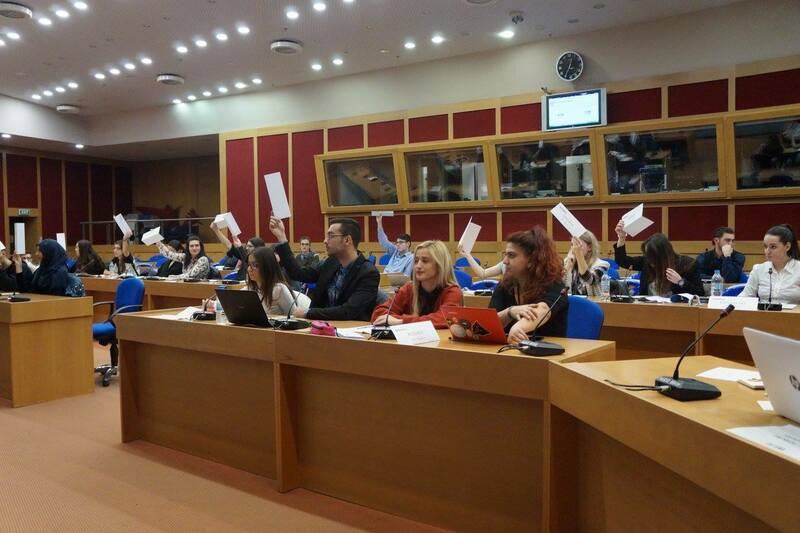 The participants, keeping in mind their personal opinions, knowledge and by sharing facts, but trying, at the same time, to follow the guidelines of the political party they were representing, they managed to reach on a common agreement and form a report that was positively voted from the majority of the MEPs. In this report, they managed to include facts that they were discussing and learned during the Pilot Activity, as well as suitable solutions to the problem as they discovered them through the immediate contact with the refugees and the discussions with the Academics. As a main output of RESTART Project in total is the Policy Paper which will be officially released at the end of the Project, reflecting the impact, input and deliverables of all activities implemented within the project’ life cycle and will be disseminated in a wide national and European range. Participants negotiated on the topic “The refugee crisis as a factor in the raise of Euroscepticism in the E.U. : The integration of refugees in Europe under the aspect of secularism and the defense of human rights in light of EU Charter on fundamental rights“. During the Simulation, participants understood the way the European Parliament functions, the decision making process, its policies and structures. Participants formed coalitions, elected their leaders and negotiated on the document approved, where they requested, among others, more job opportunities and social inclusion opportunities for the migrants, open and free access to the education, tolerance, solidarity and responsibility between member states of the EU for the integration of the high refugee flows. Under the guidance of the expertised personnel of the Board Members and I.R.T.E.A.’ personnel they negotiated using the Rules of Procedure of the European Parliament, integrated to the Simulation’ needs, which the implementation team explained to them, while also using the Study Guide prepared for the Simulation.